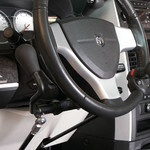 The Push Rock style hand control is a favored by many for its easy to learn, comfortable to drive operation. fer several different configurations of this popular model. The handle comes in several shapes to customize the hand control to your specific driving style and the handle is easily removable to prevent unintended use of the control.